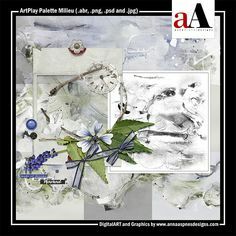 New Artsy Digital Designs Antiquity are now available in the aA store. Details. 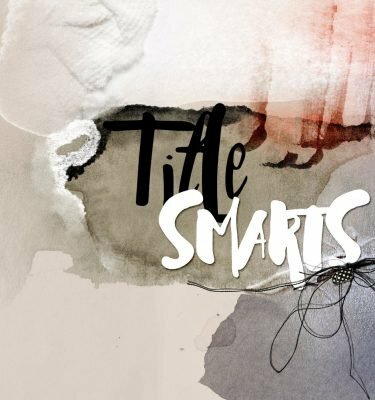 Each of the 5 new artsy digital designs Antiquity is 20% off or available as a collection discounted by almost 50% through August 12, 2016 at 9 am EST. Origins and Background. I was born, and for the most part, raised in England. I never really paid attention to my surroundings. It could have been my own age prevented me from appreciating the history, but more so, I think I just took England for granted. For many years it was simply home. When you see something every day, it loses it’s intrigue and beauty. Take Lincolnshire, for example. This is the county where my parents currently live. They see rain and grey skies, while I marvel at the size of the trees and the bright green foliage. The hodge podge of old buildings in disrepair could be considered scruffy or charming. It’s a matter of differing perspectives. The sheer age of everything in England remained with me throughout my trip to my Homeland. 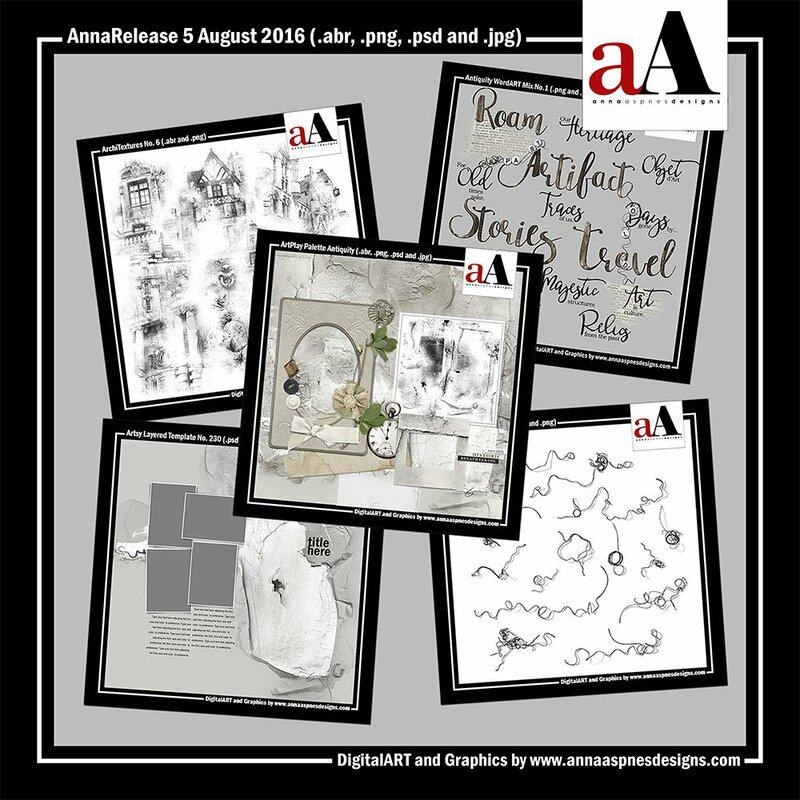 I hope to share a few highlights over the next week but in the meantime, I’m sharing a brand new release from Anna Aspnes Designs inspired by the notion of ‘Antiquity’. 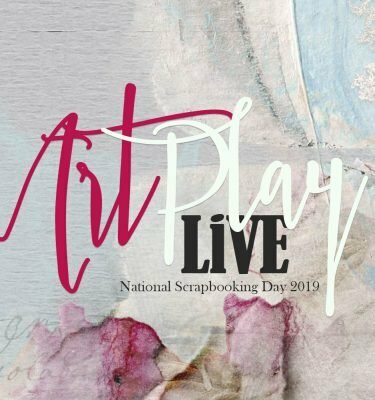 This ArtPlay Palette collection is open to your own interpretation but I invite you to revisit some ancient artifacts of your own, create some art and perhaps see something hidden in your past in a new light. AnnaRelease *Antiquity*. 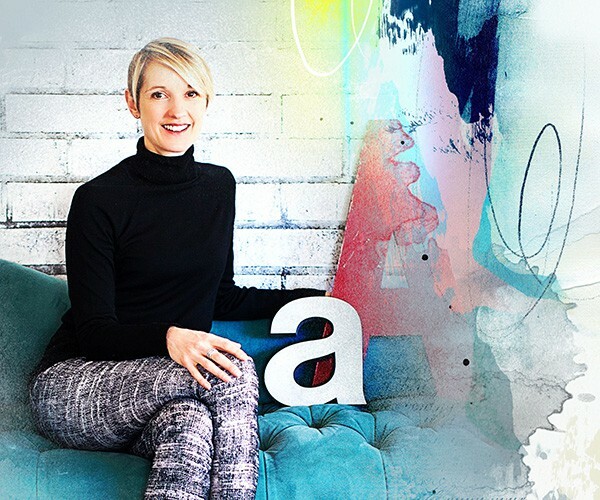 This limited option enables you to purchase my entire release of 5 new artsy digital designs Antiquity products at a almost 50% discount. 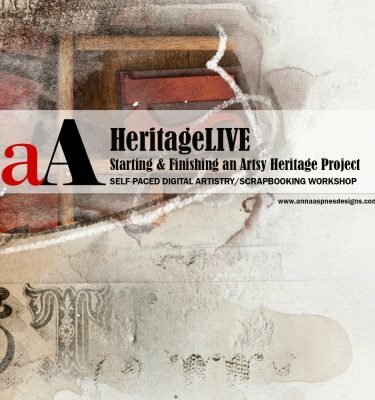 Please note that this aA DigitalART collection will no longer be available after August 12, 2016 at 9am EST. 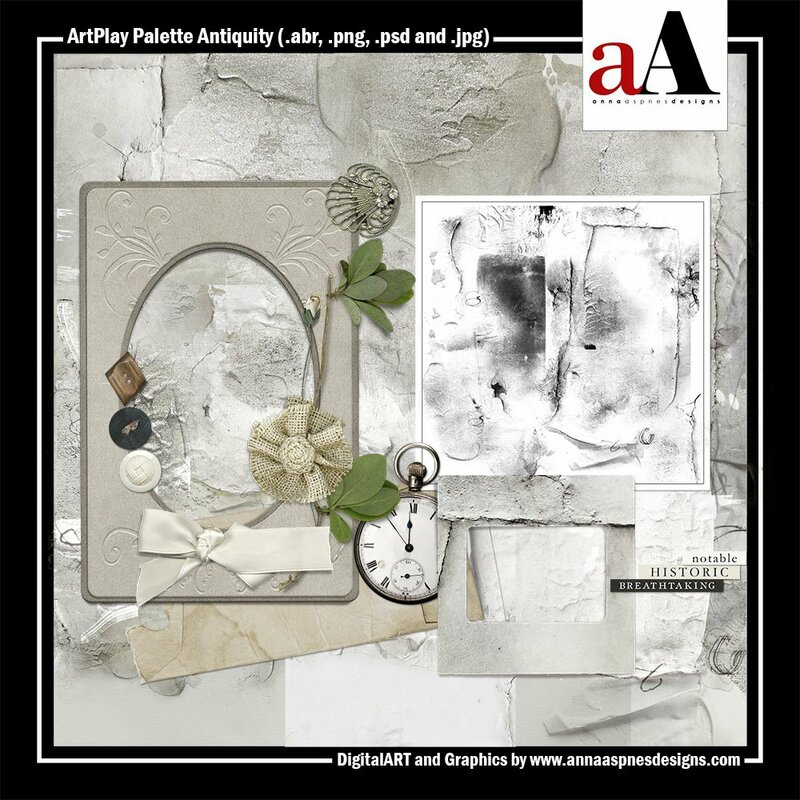 ArtPlay Palette Antiquity. Shades of stone, distressed paint and antique paper are blended to create a collection for commemorating relics from the past. 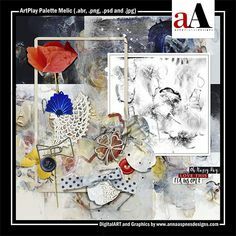 The places you’ve been, the people you loved and the traces of what once were… This ArtPlay Palette includes 10 artsy and solid 12 X 12 background papers, a 15 – piece BrushSet, 12 transfers/overlays and 14 dimensional embellishments, delivered in .psd and .png format to allow for maximum customization. Antiquity WordART Mix No. 1. 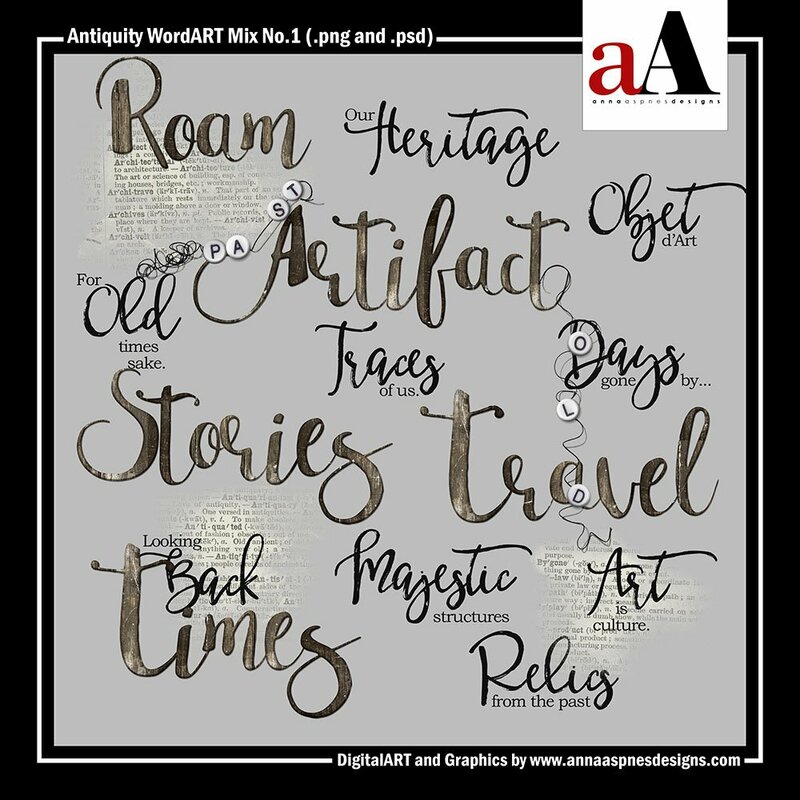 A collection of 19 varied WordART elements relating to *antiquity* to include 5 WoodWords, 9 WordART quotes/titles, 3 WordTransfers and 2 BeadedThreadz designed to be mixed and matched to create custom WordART titles. Files are delivered in .png format unless otherwise noted. UrbanThreadz No. 11. 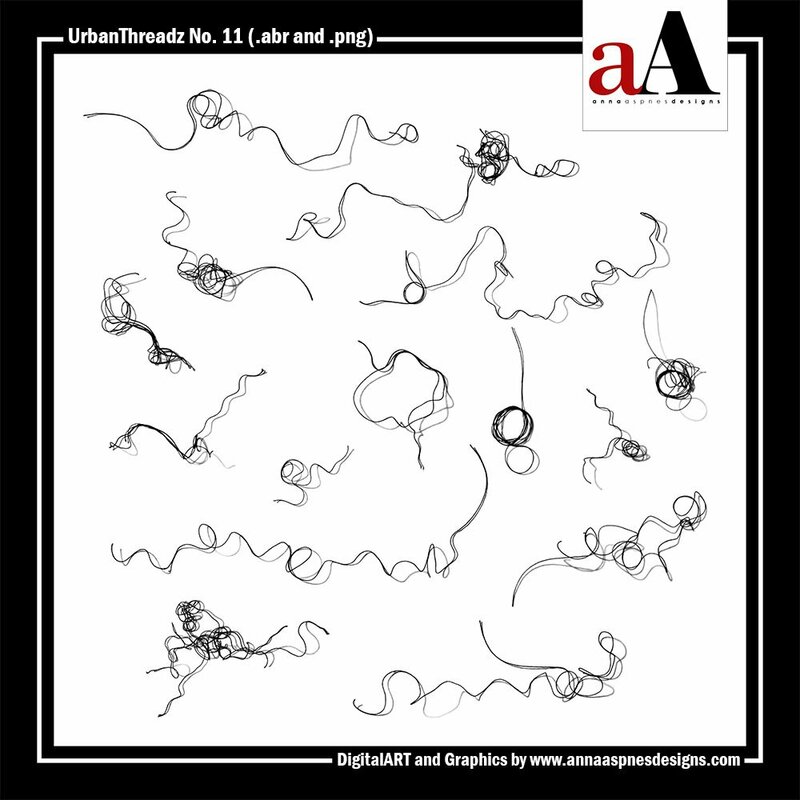 A collection of 15 messy thread elements delivered in .abr and black .png format. Stamp on a new layer in black for best results. Brush sizes are 367-1696 pixels. 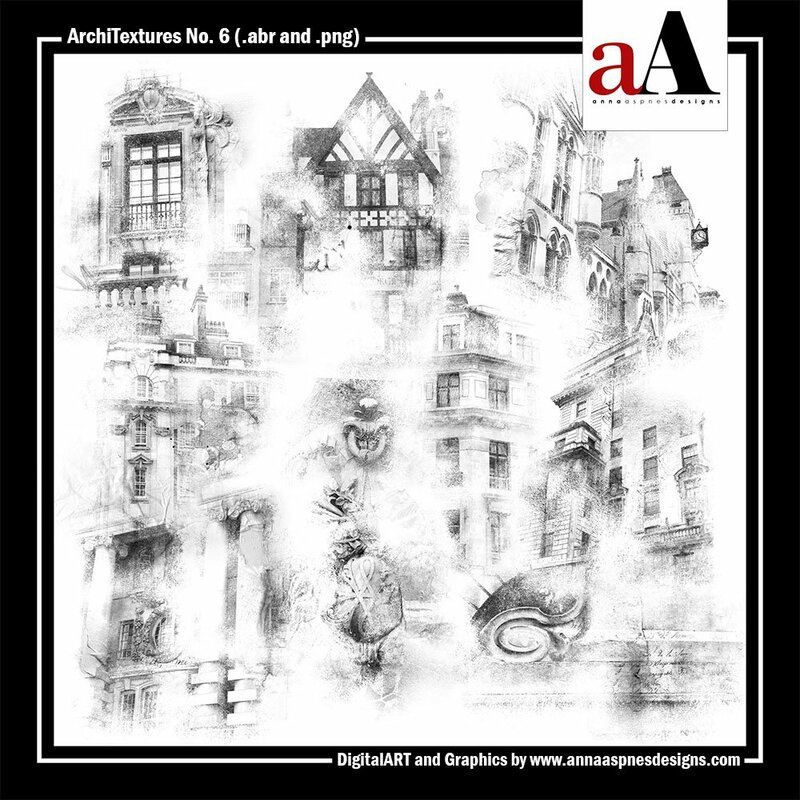 ArchiTextures No. 6. 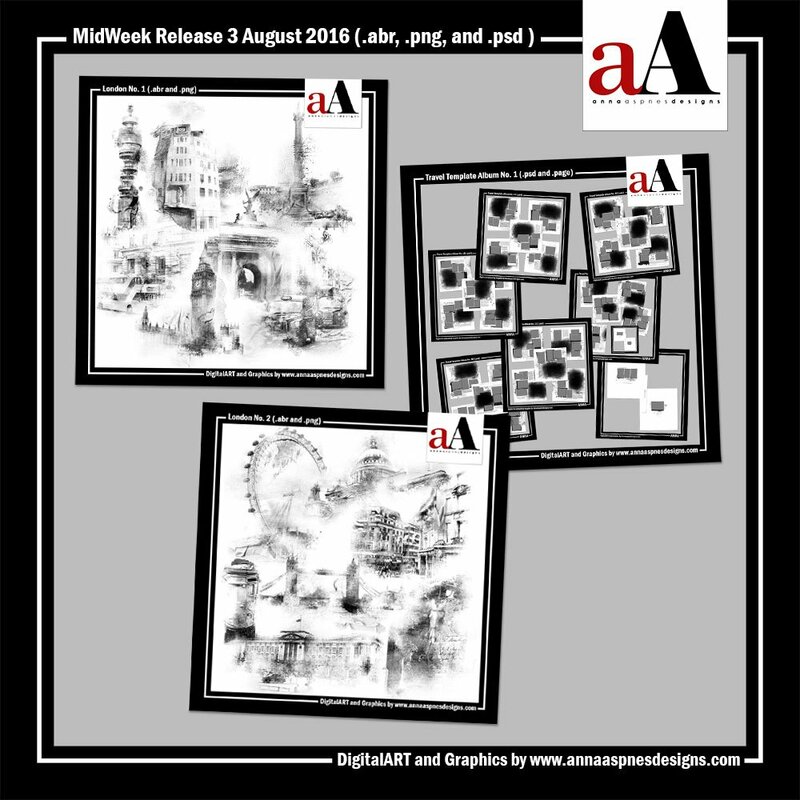 A collection of 9 architectural brushes delivered in .abr and black .png format. Brush sizes are 2893-3551 pixels for PSCC users and 2475-2500 pixels for Elements and previous versions of Photoshop users. 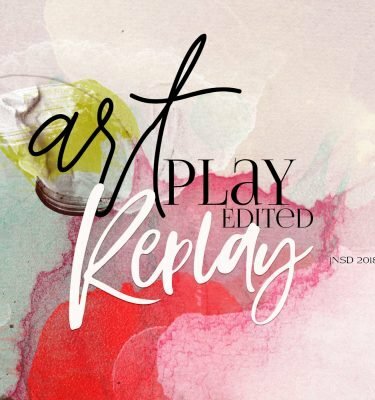 Artsy Layered Template No. 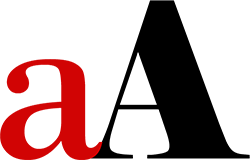 230. 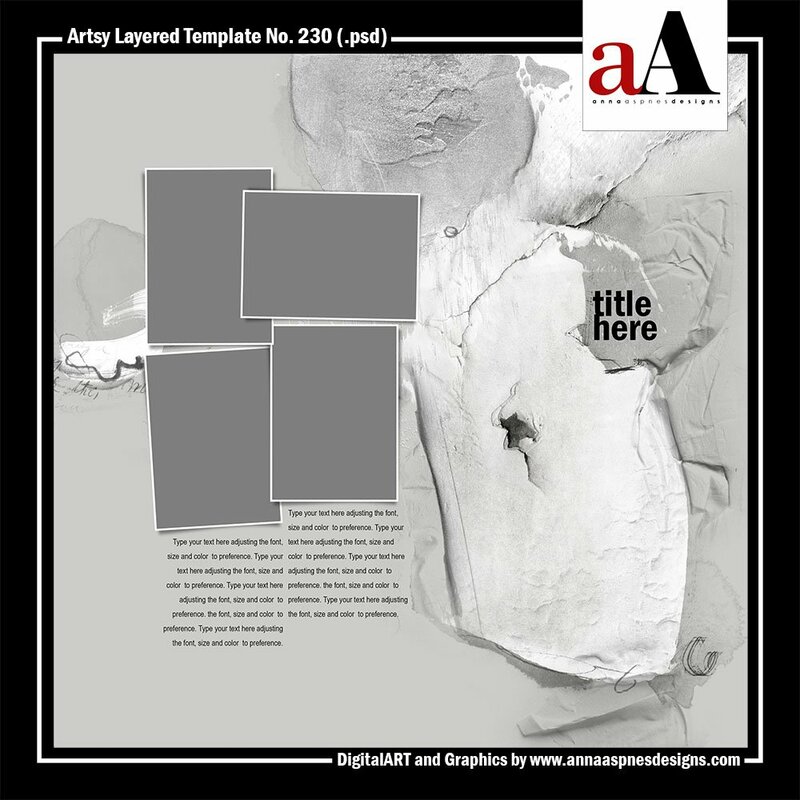 A 12 X 12 Artsy layered template featuring numerous masks designed for use with the clipping mask function or for re-coloring in Photoshop, Elements and Paint Shop Pro. 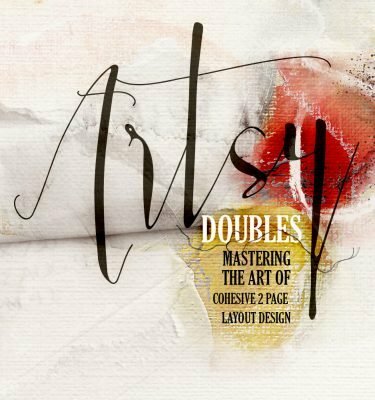 All layer styles, masks, frames, brushwork, title and text boxes shown are included. Simply clip your images to the FotoBlendz masks and add your own words.